I'm back on Whidbey! Any chance you guys want to meet up after SNOWMAGGEDON, or any time for that matter to talk some Nootka fishing? I'm down in Langley but anywhere works for me. North=Holiday Sports, South=Sportsmans Warehouse, I can make a trip of it either way!! 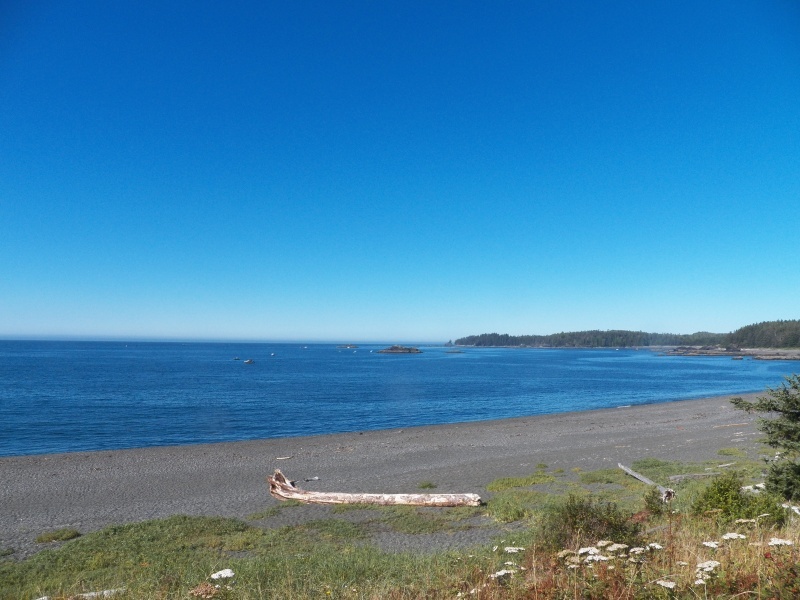 The hot spot at Nootka isn't in the sound. It's out at Bajo Point if the conditions allow. It is about halfway between Nootka Sound and Esparanza Inlet on Nootka Island. If it is too rough out there, then you can go back towards Friendly Cove and tuck in behind Maquinna Point. Bajo is very exposed and there are lots of reefs. If you can fish at high and there is little swell, you can fish in the larger areas between patches of kelp. A Buzz Bomb or Point Wilson Dart will keep you busy (and not busy screwing with tackle and down riggers). Here is a picture looking out towards Maquinna Point showing some fishing boats. I went out to Bajo an hour earlier and there was only one other boat willing to bob around out there. By 11 am the wind came up, the waves increased, and it was time to leave. Two miles back behind Maquinna it was calm and sunny. The perfect place to fish with a down rigger. Thanks for the info! I'm assuming the Reef is like fishing the San Juans and needs to be fished off the bottom/suspended? I'll plan on rigging a couple rigs for casting and mooching if I get a break in the weather to run out there! Tom, The guy's name is Murray. Super laid back. He originally posted it on craigslist and I thought it was a scam because it took a while to here back from him. Turns out he just likes to spend a little time in Cabo!! He now has it posted on AirBnB https://www.airbnb.com/rooms/18237222?guests=1&adults=1 , but I think just e-mailing him would help keep your costs down. mlv@shaw.ca I was suppose to go last year but some medical things popped up, but my aunt and her husband went mega moolah casino. He let me know if we take care of it and are good guests he'll keep us in the rotation!